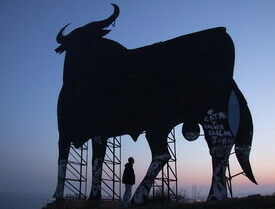 You're driving around Spain and there on the hill in the distance you see a huge silhouette of a black bull…impressive and nameless, but what exactly are they doing there. The bulls first appeared in 1957 and were commissioned by the Osborne sherry company of Jerez (Sherry), however back in those days the name of this famous sherry was also attached to the bull, until a law was passed in 1994 banning this type of roadside advertising, so the name disappeared. And although there were protests at the time for the bulls to be completely removed, however by now the bulls where nationally renowned and due to the public response the official order to remove the bulls was lifted as long as they where completely blackened out and all references to the original advertisement were removed. It was the courts that eventually allowed these signs to remain on the grounds that it has become a part of the landscape where it is present and its "aesthetic or cultural significance" thus turning it into a figure of public domain and now as we know became a national treasure. The bulls are some 14 meters in height, although the design was much smaller during its early appearances. There are now only two signs in Spain with the word "Osborne" still written on them. One is at the Jerez Osborne winery and the other in the Puerto de Santa Maria, where the main Osborne headquarters are situated.